M75 was discovered by Pierre Méchain and then Charles Messier in 1780. Charles Messier discovered the M58 galaxy in 1779 and it was one of the first recognized as a spiral galaxy. M58 is located in the constellation Virgo, and is one of the brightest in the constellation. M58's core is dim relative to other spiral galaxies and plays home to a supermassive black hole — it's 70 million times the mass of Earth's Sun. May is the best time of the year to view M58. In the Virgo galaxy cluster, M59 is the largest elliptical galaxy, yet it is significantly less massive, and less luminous, than other elliptical galaxies in the cluster. M59 contains an inner disk of stars which includes 2,200 globular clusters as well as a supermassive black hole with a mass 270 million times the size of Earth's Sun. M59 is located near M58 and M60 in the constellation Virgo, and is best viewed in the month of May. Galaxy M62 earned a reputation for being one of the most irregularly shaped globular clusters in the Milky Way. Experts believe the location of M62 exposed it to galactic tidal forces which displaced several of the stars toward the southeast. M62 contains an unusually dense core, 150,000 stars strong, one of the first known stellar-mass black holes and a large number of X-ray binaries. M62, located in the constellation Ophiuchus, is best seen in July. M75, a globular star cluster in the western part of Sagittarius, was first discovered by Pierre Méchain and then by Charles Messier in 1780. Most of the 400,000 stars in this galaxy make their home in the large nucleus. M75 is best observed in August. In 1781, Charles Messier discovered this very bright galaxy in the constellation Virgo. M86, a unique specimen, may be either an elliptical or a lenticular (a blend of an elliptical and a spiral) galaxy. M86 resides on the far side of Virgo, about 52 million light-years from Earth, and inches closer as it moves into the center of its own cluster. May offers the best views of M86. A well-defined and symmetrical spiral galaxy in the Virgo cluster and residing in the constellation Coma Berenices, M88 contains 400 billion stars. The galactic nucleus remains active, making the center of the galaxy bright compared to the rest of the body. M88 also boasts a centrally located supermassive black hole that is believed to be 100 million times the size of Earth's Sun. M88 is best viewed in the month of May. M89, an almost perfectly circular elliptical galaxy, contains around 100 billion stars and more than 2,000 globular clusters. The brilliantly bright galaxy, due to that great number, centers around a supermassive black hole one billion times the mass of Earth's Sun. At 50 million light-years from Earth, M89 is seen most clearly in the May each year. About 59 million light-years from Earth, M90, a sparkling spiral galaxy, seemingly makes its way toward the Milky Way, breaking with the movement of the Virgo cluster. 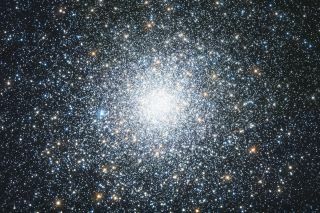 M90 houses a trillion stars and 1,000 globular clusters. This galaxy has little star formation occurring. Experts believe M90 to evolve into a lenticular galaxy eventually. For the best views, look for M90 in May's night sky. About 33 million light-years away from Earth, some 40 billion stars call M95 home. Messier's colleague Pierre Méchain discovered the barred spiral galaxy in 1781. In M95's tightly wound spiral arms, star birth activity sparkles with countless young, blue stars. Aprill offers the best time to view M95. Home to a trillion stars, much hydrogen gas and a lot of interstellar dust, M98 contains many star-forming regions. At 44 million light-years from Earth, M98 is one of the lightest in Messier's list, and is best seen in May each year. M108, located in the constellation Ursa Major, is 46 million light-years from Earth. Though no well-defined spiral pattern has been seen, M108 is listed as a barred spiral galaxy. M108 contains young star clusters, supershells and a supermassive black hole 24 million times the size of Earth's Sun. M108 sits just under the bowl of the Big Dipper. The galaxy is most clearly viewed in April, but for people in the Northern Hemisphere can be enjoyed year-round.